This deluxe adult Boba Fett costume will leave you feeling well equipped to travel the galaxy. 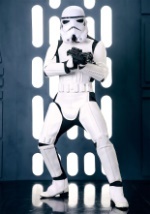 The polyester uniform is comprised of molded body armor and a belt for a 3 dimensional-look. The wrist gauntlets add great authenticity to your costume while the brown cape drapes nicely behind your shoulders. A two-piece full head PVC mask completes this Boba Fett look. Feel just like the infamous bounty hunter with this deluxe Boba Fett costume.